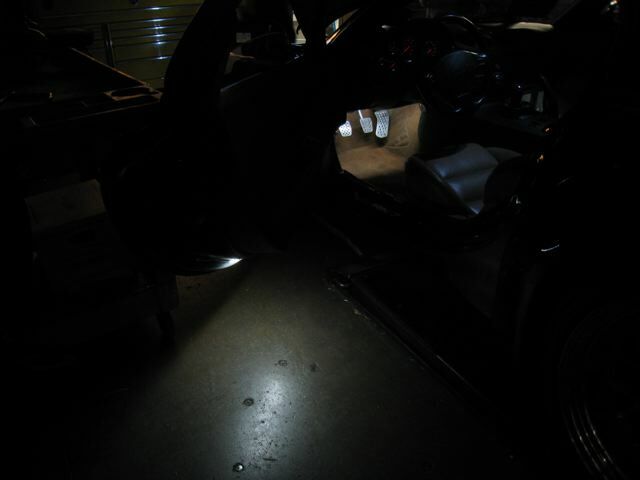 Here are some night pics, it appears the LED light is not a good flash source for a camera flash. 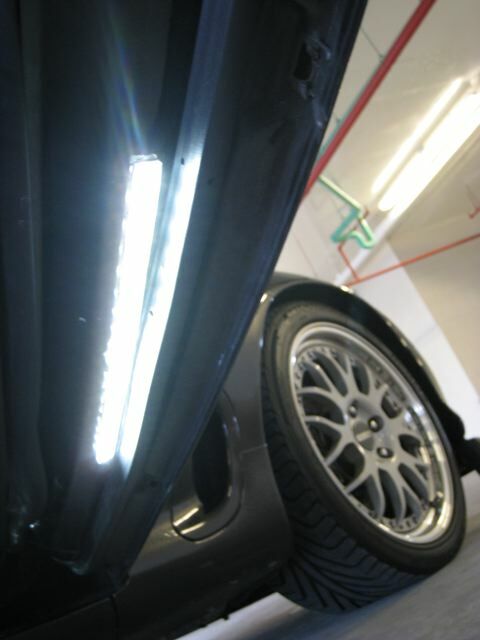 the LED's in these pics are front driving, rear markers, license plate, back-up and dome light only. seen the car in person, the lights are bright and look very good. recommended if your looking for the pure white look, very clean. a white LED behind a red lens is going to look dim." DCrosby, this may be why your 3 watt LEDS looked so dim. It Wasn't that they looked Dim, it's that the Change in brightness between running lights 6v and 12v to when you're braking. If you look at the Video, it's astounding how little difference is perceivable from Running Lights to Brake Lights. Tony the gauge lights look good, I'll check it out in person after sevenstock. Interesting. Not good if you can't tell the difference. I'll give it a shot once the car is back and will post up the results. OK SO WHATS THE BEST SETUP!! you want it. I recommend the 3157-WLX3 for the brightest. Looks very cool at night. thanks for the post. Do you mind adding what the part numbers correspond to? ie 1156 is the tails and you need 4 etc.. I'm not sure which I need. See the attached guide for which lights go where. Match it up with the LED counterparts and you're good to go. Bringing back this thread to post the results of my exterior LED lighting project. I am very pleased with the results and wanted to share. 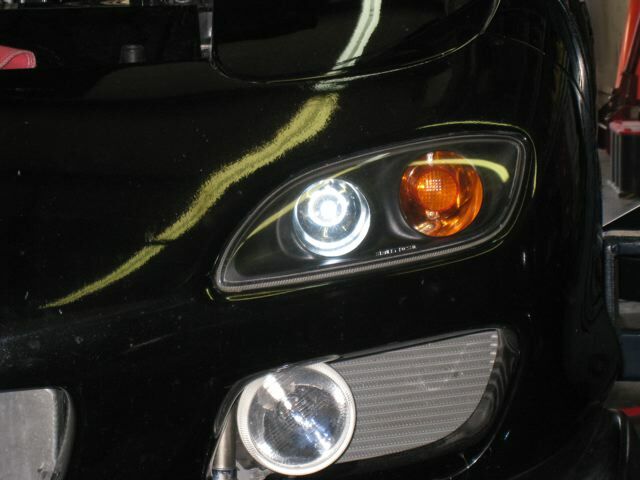 My number one criteria with the LED replacements was to have equal to or greater light output than the stock OEM bulbs. With the exception of the rear center stop lights, I easily achieved this with the newer style LEDs available on the market. All of the LEDs I used are dramatically brighter than the OEM bulbs and are a nice upgrade to the car. So the result is very nice. The light output is greater than the stock bulbs and in some cases (trunk light, backup lights, license plate lights) dramatically better. With the exception of the center stop lights, the back running lights and stop lights are brighter than the stock units. There is also a very nice differentiation from when the lights are on to when I depress the brakes. Note here: the LED bulbs are single polarity and have to be installed in the proper direction or you won't get a differentiation between the lights and when you depress the brake. I originally had them in backwards. When I turned the lights on I was blinded by the brightness of the running lights but very disappointed with the brake lights. 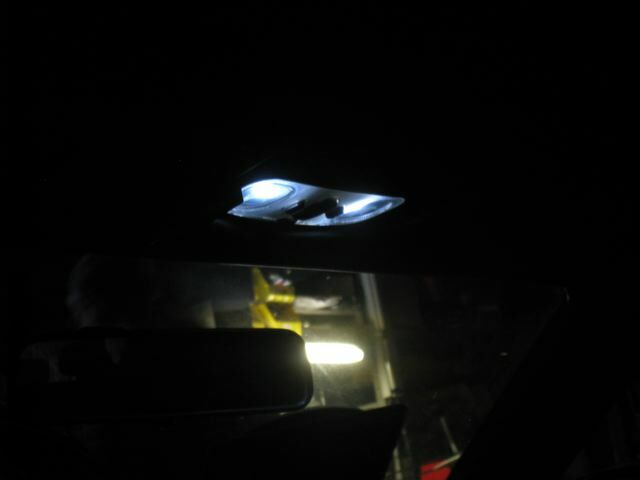 This was because I had installed them backwards and all 5 watts of power was on when the running lights were turned on. With them in correctly you get 3 watts of running lights and then 5 watts of braking lights which will make your stock lights look very weak. I am still not pleased with the center stop lights (three bulbs in the middle) and the front turn signal lights. The center stop lights are too dim for me - probably fine for most - but I think they LEDs should be of equal or greater light. So, I temporarily have one stock bulb in the middle and two of the above referenced LEDs in but I have ordered another style from autoillumination.com to see if the light output is any greater. I'll post up results then. For the front turn signals, I am not pleased with the "5 light" star pattern outputted by the current LED lights I have installed. For you 93-95 spec bumper guys this will not be an issue but if you have a 99 spec bumper than it will be. What I mean by this is I like to see uniform light coming from an LED. Because the LED bulb I am using has 5 LEDs on its face, I see this coming thru the lens cover and I consider this to be a bit "ricey". I've ordered another set of bulbs that in theory will fix this but we shall see. These will definitely add some lighting punch to your interior. 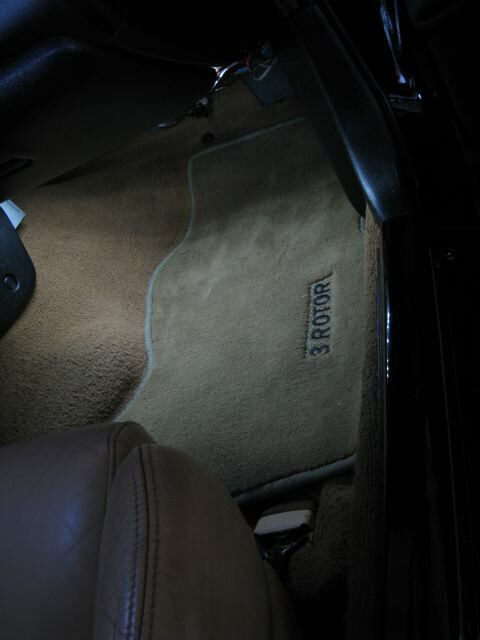 And finally, I had added to the interior of my footwells and to the bottom of my doors 18 LED strip lighting in white. When I open the doors, these come on. It's great lighting at night and looks cool too. Got the idea from a Mercedes I saw. SuperbrightLEDs.com offers numerous strip lighting you could use for this. I am sure yuo can. Pull out the bulbs and see what style they are and I'll give you some recommendations. David, thanks for taking the time to post all of this . I wish I wouldve taken a chance to check them out in person at the Carlisi event. I have had LEDs in the front parking light for my 99 spec bumper for years now (along with HID headlights) but plan to upgrade the taillights as well as the interior map light. Btw, I'm not seeing the pics you put up in post #70.
whats the difference for the tail lights? i would definitely need to do my map and glove box.. i want to get the brightest one possible. The difference is they are LED and the light is brighter than the stock ones. That might not be a good reason for you to do this though but I have wanted to replace all of the 15 year old bulbs on the car and decided LED was the way to go. You'll definitely see a difference in the map lights by using the ones I posted above. I haven't replaced the glove box one yet as it is wired in but will do so soon. hey great info! thanks for rising this from the dead, i would love to change all bulbs to leds. I was thinking a complete interior and exterior swap with the exception of the headlight bulbs. Of course, this would be approved by the forum also. On a side note.... I'm not an electrical guy, but why hasn't anyone thoght of the idea of offering LED lights in H4 or other widely used lamp sizes, so you can just switch them out with the OEm ones? I think it has to do with brightness, led are bright but not bright enough to illuminate the road. Plus if they did design one that can illuminate the road it would probably have heat issues. They do make H4 Day time running lights, since they do not need to be so bright. You are correct sir although much progress has been made in LED headlight technology. 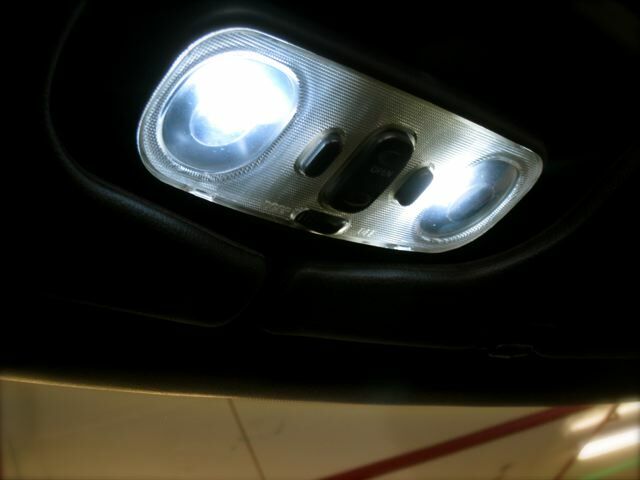 In fact, a few car makers showed off LED headlights a few years ago and my guess is these will become standard equipment on car in the 5 year range. 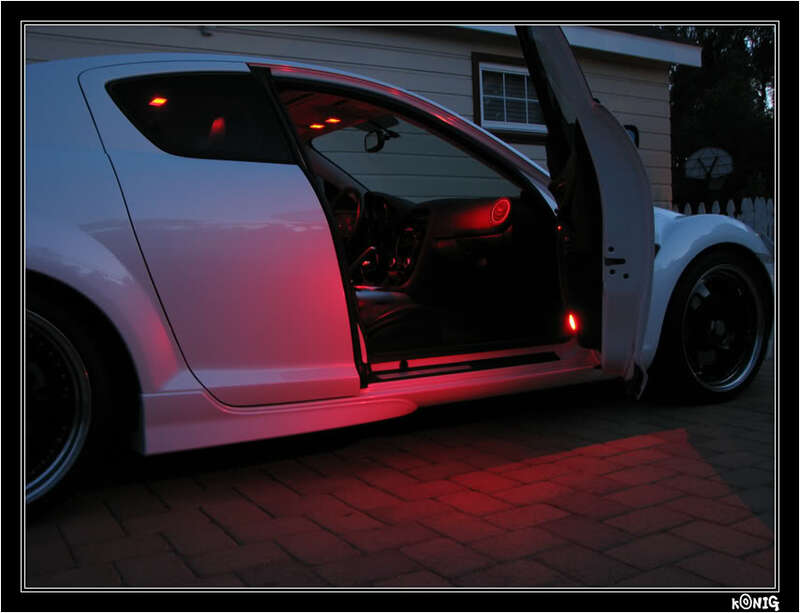 LEDs do not run hot, they consume very little power and they are basically flat so automakers can incorporate them easily into their designs.